This hanging rope is used to holding flower pot. The rope is durable, and it can hold heavy flowerpot. The hanging rope can be used inside or outside. To hang your plant just insert your pot into the hanger. Pure handmade weave, made of natural jute, it's well-made and sturdy, with a simple, natural look that fits right in with any decor. You can hang at the ceiling, Plant Holder balcony, window, iron shelf, etc. Vintage-inspired plant hanger. Simple, yet meticulously handcrafted, this beauty would be gracing your home or balcony garden, or brightening up an office. No plant or flower pot included in this item. Great for indoor and outdoor use. Match with round or square flower pot to decorate your home. The pot hangers for plants will impress your guests, friends and relatives. 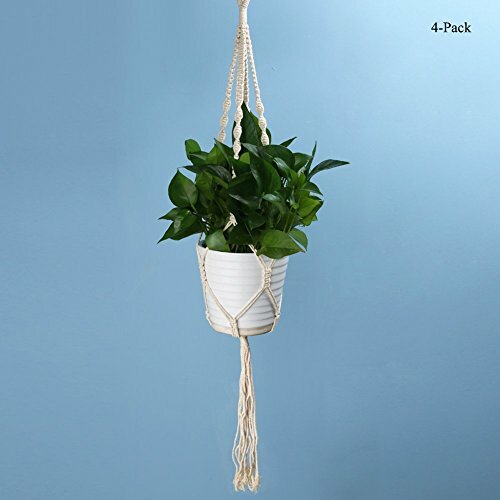 Package including:4x plant pot Hanging Rope (other parts are not includes). If you have any questions about this product by WCIC, contact us by completing and submitting the form below. If you are looking for a specif part number, please include it with your message.